Sundern asks, "What does history teach us, Mrs Himmler?" In the old dairy in Sundern (Sauerland), the organizational team has just gotten more chairs. Almost a hundred people are sitting in the hall where the film "My Family, the Nazis and I" is being screened. 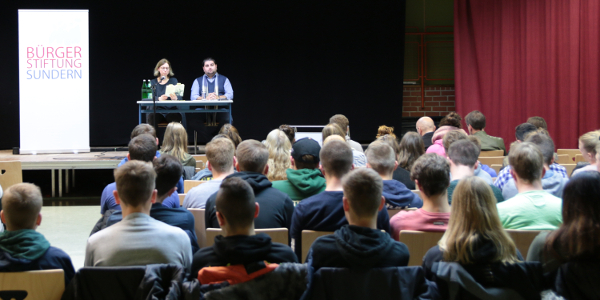 Afterwards, one of the protagonists of the film is available for an interview with the audience: the author and historian Katrin Himmler, grandniece of the Reichsführer SS and organizer of the Holocaust, Heinrich Himmler. The evening is the last in a series of events organized by the Alliance for Diversity and Tolerance in the City of Sundern. "Each time we had to get more chairs", Irmgard Harmann-Schütz, one of our contact persons from the alliance, is pleased to say. For this very last event of the series, the alliance took the commemoration day of the Reichspogromnacht on 9.11.1938 as an occasion. The fact that all events were so well attended strengthens the relatively newly founded alliance in its project. "People have come here who we didn't even know," Irmgard and her alliance colleague Sehrat Sarikaya remark. In the small town with 3000 inhabitants, that is also an important sign that something is moving there. "I notice that as part of the alliance I am perceived publicly as a person and that from this position I can more easily win people over for things than if I tried that as a politician," says Irmgard. On the way to the event Sehrat tells the story of the alliance. A Sunderaner was a victim of racist mobbing at his school last year. Then a person intervened who recognized the need for anti-racist work in Sundern. Her initiative met another person who wanted to organize something for the 80th anniversary of the pogrom night. Shortly thereafter, one person took note of the call from our Action Fund ViRaL and the newly formed alliance was the very first to propose an action to us. After the break, Katrin Himmler is asked how her work was received by her family. Katrin Himmler is the grandniece of the Reichsführer SS and organizer of the Holocaust, Heinrich Himmler. This, and also what he had done, she always knew, she says. In the research on which her book "Die Brüder Himmler: Eine deutsche Familiengeschichte" (The Himmler Brothers: A German Family History) was based, however, she dealt with the history of the entire family. Until her research, the family lived with a version of the story in which Heinrich was portrayed as a loner. With her research, Katrin Himmler uncovered the Nazi convictions of his parents and brothers. In the film, Niklas Frank, another protagonist, described the authoritarian, cold and conditional upbringing he was subjected to by his parents. The question arises as to the extent to which this style of upbringing was widespread beyond the immediate circle of Hitler - to what extent people from the audience also experienced a similar upbringing. The next morning, Katrin Himmler reads from her book in a school auditorium. The audience consists of around 200 high school students and secondary school pupils. In comparison to the previous evening, the question is asked very soon as to what extent parallels can be drawn between that time and now. A conversation develops about individual abilities to act: how do you take action against expressions of racism in your own environment? In Sundern, too, the new organization of the right wing forces and the new shape of their discourse can be felt, Sehrat told me last night. The two hours go by quickly - a lot still needs to be said. Probably the history teachers* who co-organized the event will continue the discussion in the classroom. The alliance will also remain active. Some actions are already being planned, others will follow. "Thanks to the support of ViRaL, we as a new alliance are not tied to any fixed plan - we can form new partnerships at short notice and thus expand our activities, which is very helpful," Sehrat tells me.